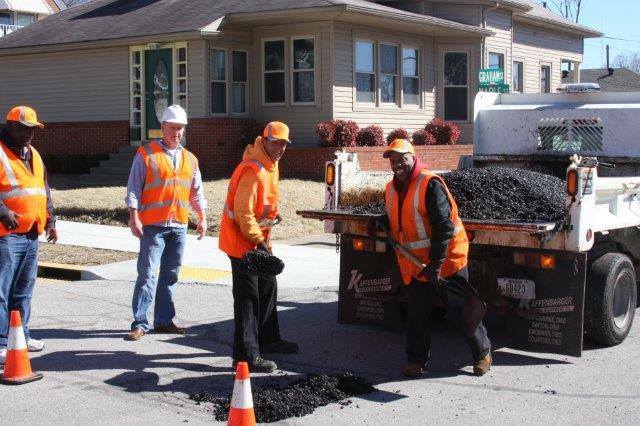 The Street Department has been hard at work all year repairing roads damaged from the harsh winter of 2013. The department is now preparing for the oncoming winter months. “We’re here to work and please the community. If we can do something to give back to the people in the community, we try to do it,” said Clark Miles, Streets and Sanitation Commissioner. Areas that have been paved include Tall Oaks off of Charlestown Pike, the backside of North Haven Northaven, Oak Park Bullivard Boulevard, Dogwood Road, East Brook Bullivard Eastbrook Boulevard, Gardner Bullivard Boulevard, Tyler Ridge north of Windmil Lane Seilo Ridge N. (not north of Windmill Lane), Windmill Lane off of Vissing Park Road, some of Fulton, Higgins, 7th St. and Allison Lane in front of the high school, Bishop Road in the Meadows and a few others. Miles says the department tries to spread out the paving throughout the City as much as possible and will continue to pave as long as the weather holds. “We don’t know when the snow and ice will hit but we want to be prepared for it to happen,” said Miles. To kick off winter, the City of Jeffersonville is preparing with 1,300 tons of salt.